I decided it was time to take a stained & ripped bath towel out of rotation once and for all. I couldn't just throw it away so I cut it up and made it into something useful again. I made some homemade pads for my old swif...we'll call it a "mop"
I hated buying those cleaning pads because I felt like it was such a waste throwing so many of them away. But now I can use my "mop" again and be green too! 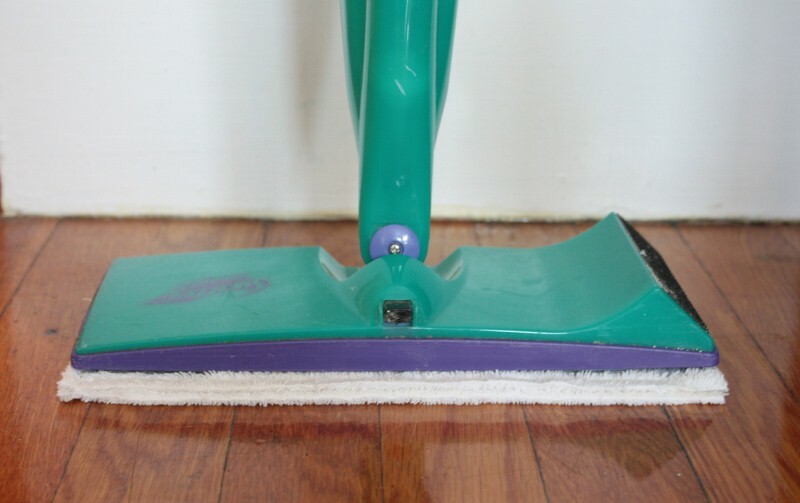 I don't use the cleaner that comes with the "mop" (it's not eco-friendly) so I typically just hand spray an eco-friendly floor cleaner and then sweep. 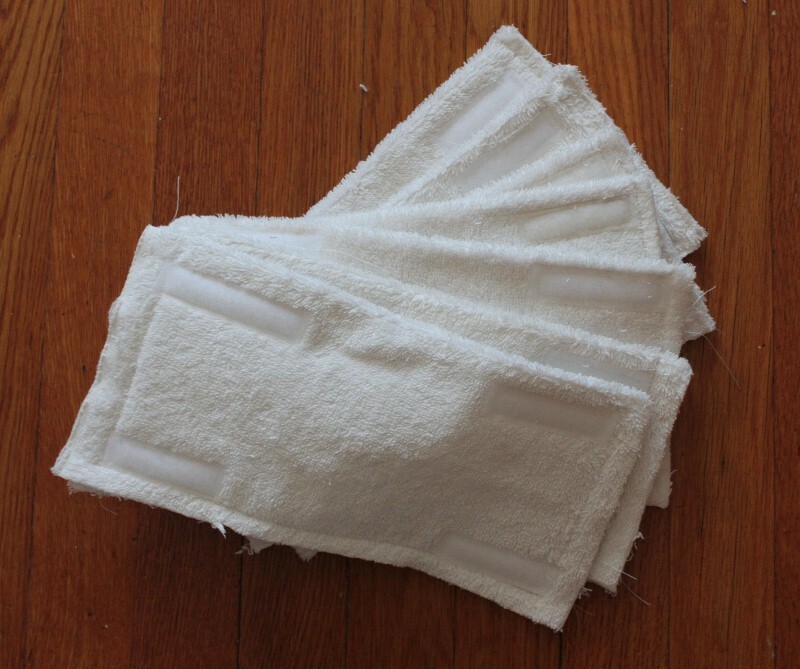 Now that I have a stack of reusable & washable pads I will be cleaning my floor alot more! i LOVE that ur green - makes me SOOOO happy! ps .. wanna trade buttons or links? That is a great Idea.. I will be using that one! You are so creative! Great idea. this is such a simple yet effective idea! i never bought one of those swiffer things because i didn't like the thought of having to buy pads/wipes for it all the time...now i think i may and just use some old towels :) (or buy some in the dollar store for use). Clever! I love finding out that my favorite bloggers are environmentally friendly. Great idea! I had pretty much given up on swiffer because I was tired of paying so much money to only partially clean my floor, its not really a good mop after-all. I think I'll go pull mine out of the storage closet and put it to good use again! Fantastic idea!! I'm sitting here kicking myself for not having thought of it who knows how many dollars ago! I shudder to think how much I've been spending on Swiffer pads. And yes, just throwing them out always bothered me too. Yeah! I will totally be doing this!!! YAY FOR BEING GREEN! I love this idea! You are so creative! I need to do this ASAP. 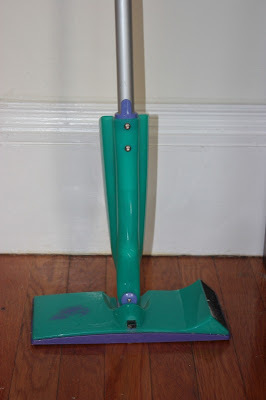 I just bought a swifer recently...I was actually mopping for a while. Can you believe that? With a real mop? What a waste of time! clever girl!! I was just using my swiffer..maybe i need some news usable pads!! this is a fabulous idea!!!! seriously you should submit it to Real Simple's New Uses for Old Things. FOR REAL!! Great, great idea! 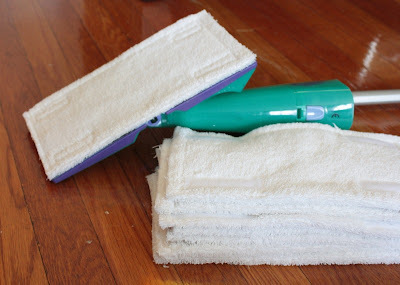 I would have saved so much money if I had used an old towel instead of boxes and boxes of those cleaning pads. Fantastic! 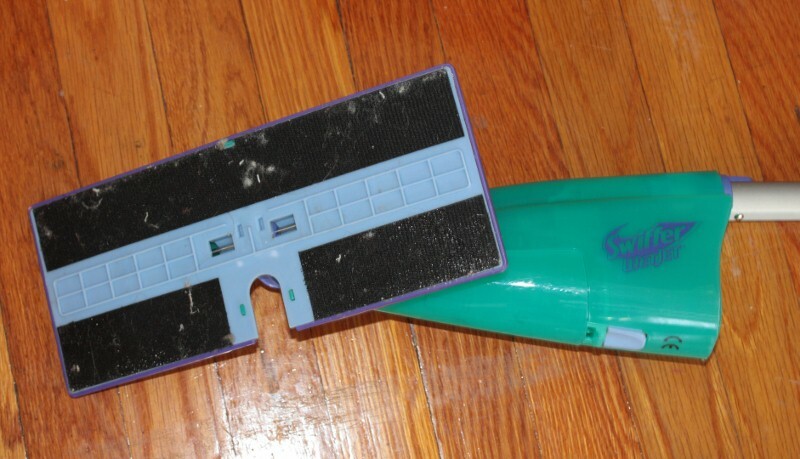 I LOVE my Swiffer, but hate the waste. Great idea. BTW, my cat is almost as terrified of our Swiffer as he is of the vacuum, which is so ridiculous! What a great idea! 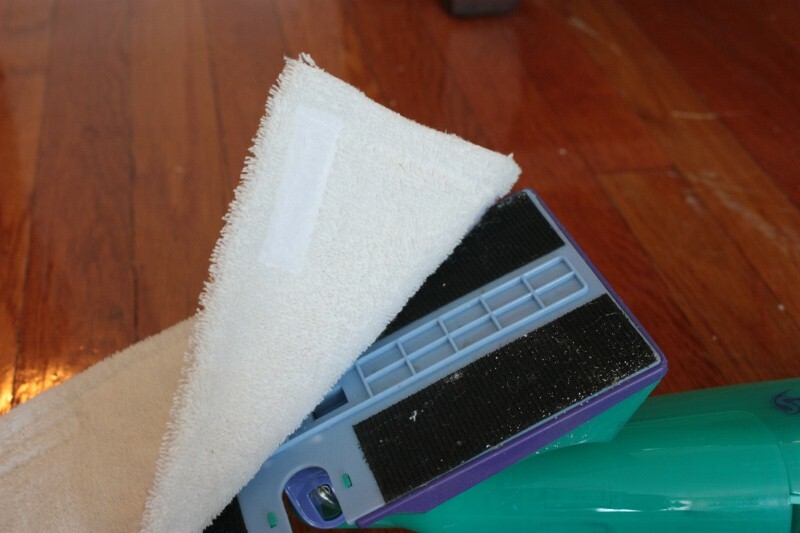 We have the Swiffer that can use dry or wet pads that you push into the top (no velcro), but I would think that you could make it work on that too. I might just have to cut one of the many towels that have been deemed "dog-worthy"! this has been on to-do list. i've read that you can fill your empty bottle with your own eco-friendly solution (like vinegar & water) by putting the bottle under hot water to get the top off. i haven't tested this method yet, but sure will be trying! You are so smart! I need to do this. Thanks for the idea. Great idea and so resourceful! That is SO brilliant. Oh my goodness! you lost me at "sewing", but i am very proud of you!!!! Nice!!! I do something similar with my old swiffer. I just fold old towels around it without actually using Velcro. The towel just seems to stay on by itself. HOLY cow! YOU are a genius! I am totally copying this. The little sewing part might throw me but I'm willing to give it a shot! So creative. And yes, green!! Wow you're crafty! Great idea and I love how they came out. Makes me want to clean! That makes perfect sense, makes me want to buy a "mop" and sew some reusable covers so that I can use the handy little device. I need to do this. Thanks for the idea.